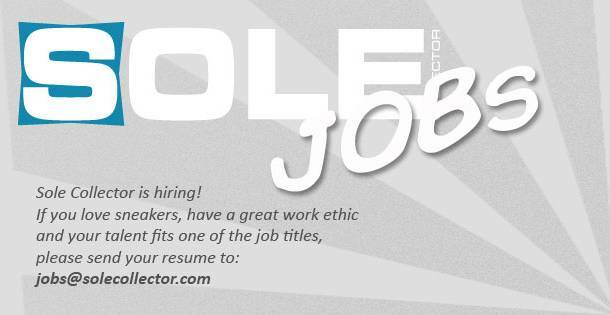 Sole Collector is Now Hiring! Find out how you can become the next member of the Sole Collector team. Since joining the Sole Collector staff last year, the question I'm asked most frequently is "How can I work for Sole Collector?" If you're interested in pursuing a career in sneaker media, here's some information on how you can become part of the Sole Collector team. We currently have openings available for multiple positions within the company. As of now, the positions are part-time with the possibility to become full-time. Interested parties can send their resumes to jobs@solecollector.com. Looking for people who are into sneakers and have the talent to write about them. This will mostly be for the digital platforms that Sole Collector runs on. This is a fast paced job that requires one to be self-motivated and professional. Having a journalism background is a plus, but is not required. Individuals with creative talents to create graphics for digital platforms, as well as print. Someone experienced in shooting and editing video. FCP 7 is our preferred platform. All of the above are long-term positions if you fit within our team. Being located in Portland is a bonus, but also not required. Good luck to all applicants!